In the 80s, the Japanese government planned to accept 100,000 foreign students. In the 90s, other types of people such as foreign laborers, and people in international marriage started coming to Japan. The number of children of minority decent suddenly increased but Japanese schools were not ready for it. Japan had little experiences in accepting immigrants and its schools had no special teachers for foreign children. Teaching methods and materials were made on trial and error base. In order to grasp the situation, the government started a survey on Japanese language education for foreign children. The Table1 shows the number of minority children in Japanese schools over the past two years. 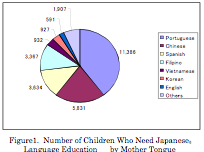 The figure1 shows the number of foreign children who need Japanese language education in 2008. They are grouped by their mother tongue. Portuguese 11,386, Chinese 5,831, Spanish, 3,634 and others, 7,724. The portion of top three languages is about 70%. In the past, Japanese language education is the central task for newly arrived children. Recently, guidance for higher education is also an important task. However, due to such reasons as unstable employment for foreigners and possible relocation, foreigners’ lack of knowledge about schools in Japan, and its educational system, some foreign children are not getting the kind of educational instruction they need. On the other hand, because of their low basic ability in the Japanese language, mathematics, English, and science, some children cannot pass high school admission tests. Even if they are admitted, many drop out of school because of a lack of adequate support or personal maladjustment. 97% of Japanese children go to high school, where as only 50% of foreign children in Japan do. There are about 5,800 Chinese children living in Japan. Their parents have a variety of visa status, such as war orphans, laborers, student visa and spouse visa by marriage. Often, the children lived away from parents. In recent years, because some Chinese remarry to Japanese, their children have new and challenging family environments with cross-cultural conflicts. Many parents with less than enough Japanese language skills do not know enough about Japanese schools and its education systems. It is only when their children come that they find out how difficult it is to educate children in Japan. Japanese school start in March, whereas Chinese schools start in June. Children who finish junior high schools or are older than 15 years of age are not admitted to Japanese junior high schools, nor can they pass the difficult exams necessary to enter high school, which is selective, not compulsive. From their arrival, children with low ability easily feel helpless about learning because of the language barrier in addition to differences in school subjects. Due to complex family environments such as unstable parents’ visa status, children cannot receive proper support from their parents. They face culture shock and future uncertainty. Moreover, schoolteachers are not able to support psychologically and study. Children who could not adjust to the new environment, lose self –confidence, become internet-dependent, depressed, refuse to go to school, and exhibit anti-social behaviors. Although educational support for foreign-born children is an urgent task, it is very hard for busy teachers to guide and support them. Most qualified supporters are people who understand the child’s cultural background and mind and can give care to them. Few people like this exist. In order to solve this problem, we must consider options as to “who can help as well as when and how.” One approach started several years ago to help lessen this problem was to have Chinese college students lend support to the Chinese children. These students teach Chinese children at public schools or NPO schools as volunteers. Their main activities of support are in the area of Japanese language learning, translation in classrooms, and counseling. Depending on the necessity, they help bridge the communication gap among teachers, children and parents. College students share their culture and educational background with children and easily form close relationships. Many children are open with these students. In turn, the volunteer students can discover psychological problems and learning difficulties. Thus, Chinese students can help teachers improve their teaching methods. Even though students are very valuable, their support must be done under supervision: student volunteers must follow rules and teachers’ directions and not make their own judgments. Students encounter a variety of tasks and situations at school, for example, corroborating with teachers, students’ privacy, difficult cases, time, and others. It is important not to withhold information about the problem and always report to the teacher and supervisor. The student volunteers attend case conferences and confer with college advisers. Foreign students, as a mentor, can give courage and hope by helping language learning and cross-cultural living. On the other hand, for college students who mainly study and part-time work, this kind of volunteering is a social act or contribution that can help the volunteer grow.